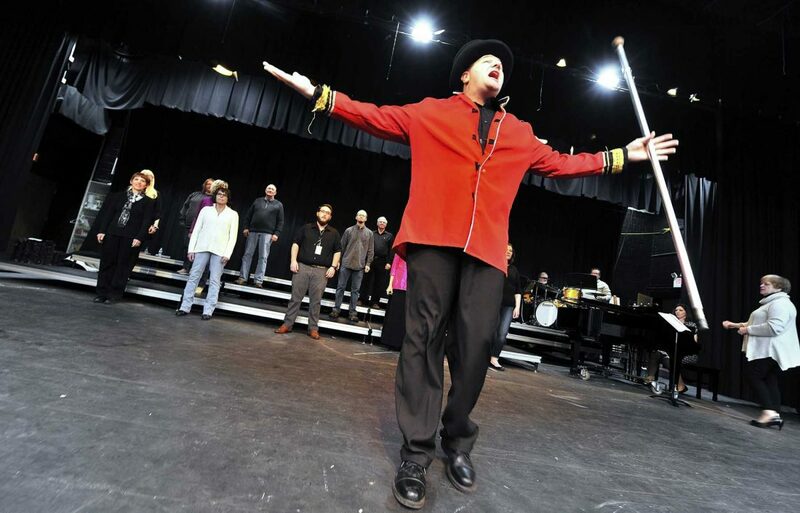 Manson Meridian Singers tenor Tony Keller, of Rolfe, finishes his solo in the opening number of their upcoming show “For Every Season A Song” during a recent rehearsal. The show, in the Kate Toben Auditorium at the Manson Northwest Webster High School, is on Saturday and Sunday. Members of the Manson Maridian Singers rehearse recently for their upcoming shows. 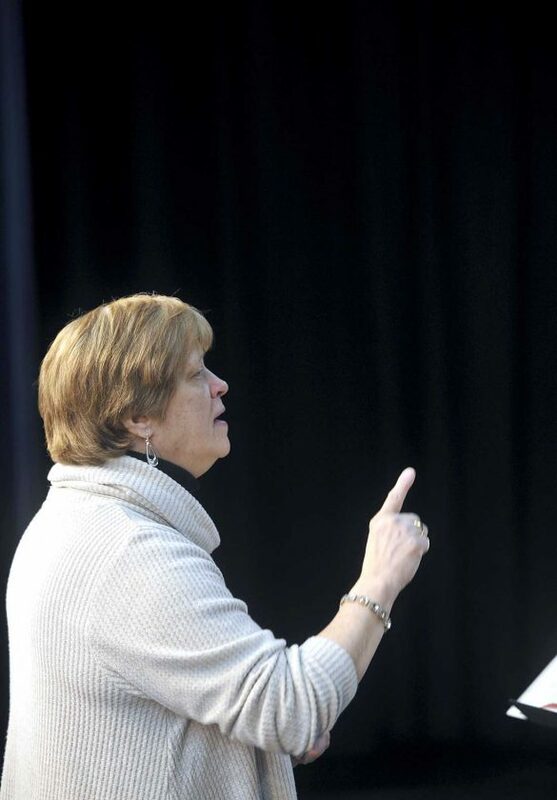 Director Lori Erkenbrack works with the group during a recent rehearsal. Erkenbrack has been directing for two years. 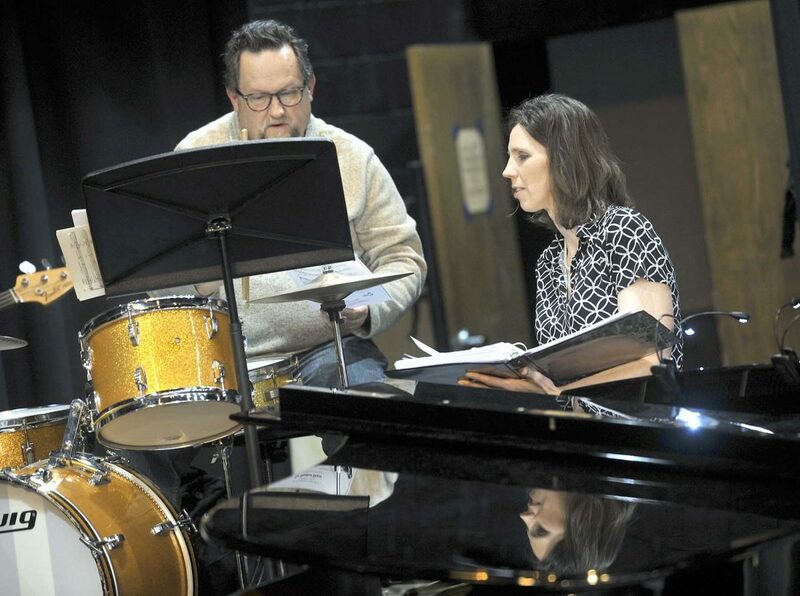 Manson Meridian Singers drummer Jon Merritt goes over some of the music for their upcoming show with accompanist Deanna Meyer during a recent rehearsal. 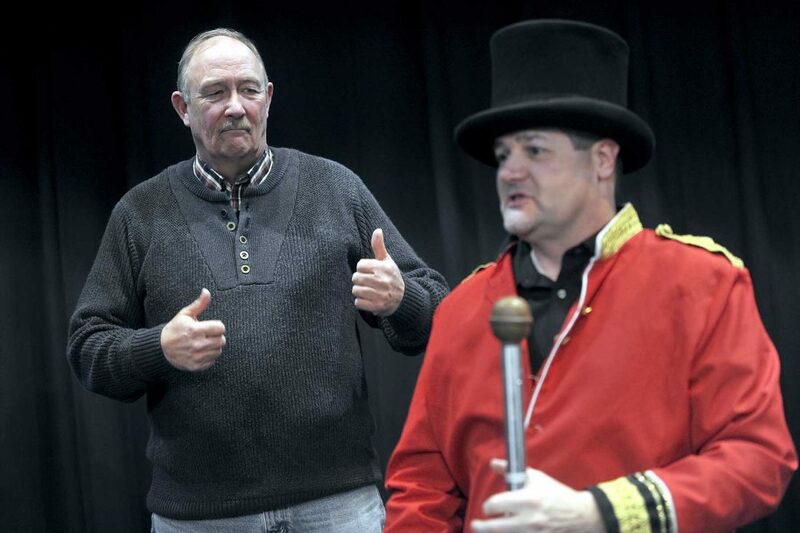 Tenor Tony Keller, of Rolfe, right, gets a two thumbs up review of his performance from bass Dave George, of Manson. 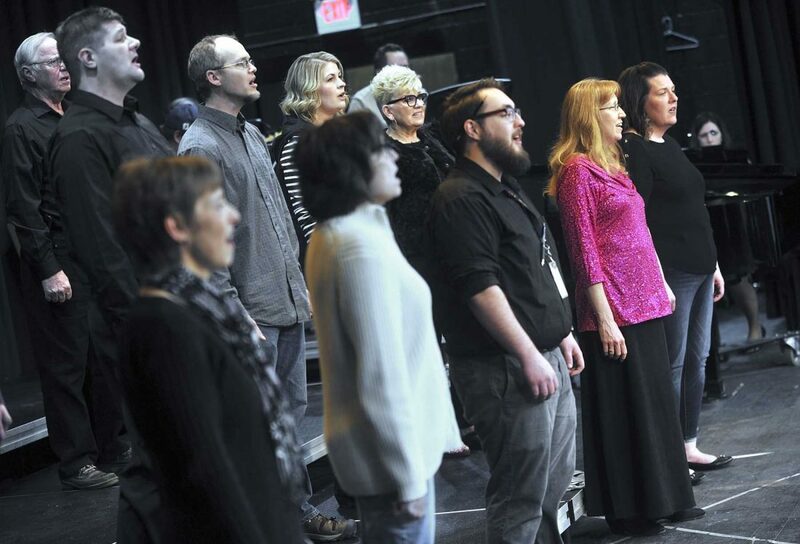 MANSON — The upcoming Manson Meridian Singers production, “For Every Season, A Song,” has nothing to do with the weather. Instead, Director Lori Erkenbrack said, it’s about life. Erkenbrack assured the audience that there won’t be any songs about the other inevitable part of life, taxes. She said there are currently 16 singers in the group. There are also four musicians and a whole crew of volunteers doing all the other essential things such as running the lights and sound. 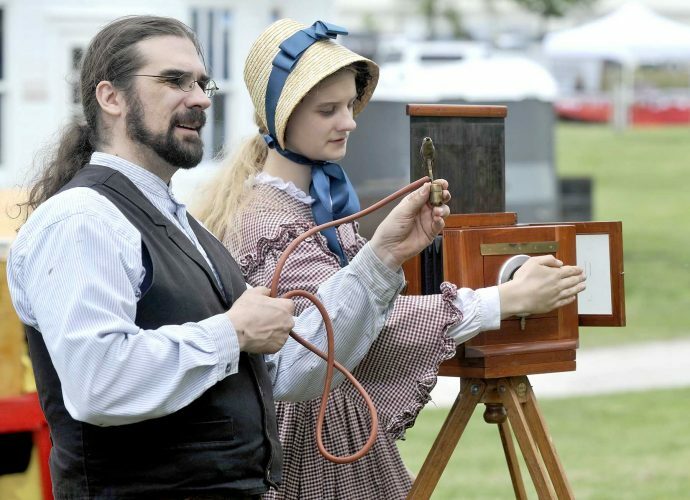 This show, the group’s 48th, marks Erkenbrack’s second year as director and 17th as a member of the group. There are years of experience on the stage when they sing. Brad Bleam, the group’s bass player, has 39 years. Many are in the double digits and several are in their first year. Tony Keller, of Rolfe, is among those new members. “I get to be a circus ringmaster,” he said. He doesn’t get a lion tamer’s chair and whip, though. “Just a costume,” he joked. Keller joined the group after seeing an article on it. David George, of Manson, wears two hats. He’s both a member of the singers and the mayor of Manson. According to the program for the show, the answer is 28 years. “It’s over twenty with a few breaks here and there,” George said. What keeps him coming back season after season? He enjoys seeing new members join up. Sandy Jones, of Manson, has been a member for more than 20 years. She summed up what’s at the heart of each member on the stage. “It give us an opportunity to sing,” she said. Two public performances are scheduled. They are at 7:30 p.m. Feb. 9 and 2 p.m. Feb. 10. Tickets are $10 for adults and $8 for students. The performances are in the Kate Toben Auditorium in the Manson Northwest Webster High School in Manson.